The release of Total Access Admin 2013 added many new features. Due to customer demand, we’ve updated Total Access Admin 2003 from version 11.5 to 11.6 to include the new features. The primary difference between the 2003 and 2013 version is that the 2003 version doesn’t require installing Access 2007 or later on the machine in order to support the ACCDB database format. It supports Access databases in MDB formats and does not require Access to be installed on the PC. New forms to view the activity log, and more. Read our New Features page for details. Download the free, fully-functional Trial Version to see how helpful Total Access Admin can be for you. Total Access Admin 2003 supports MDB databases created in any version of Microsoft Access. Existing customers can upgrade at a discounted price. 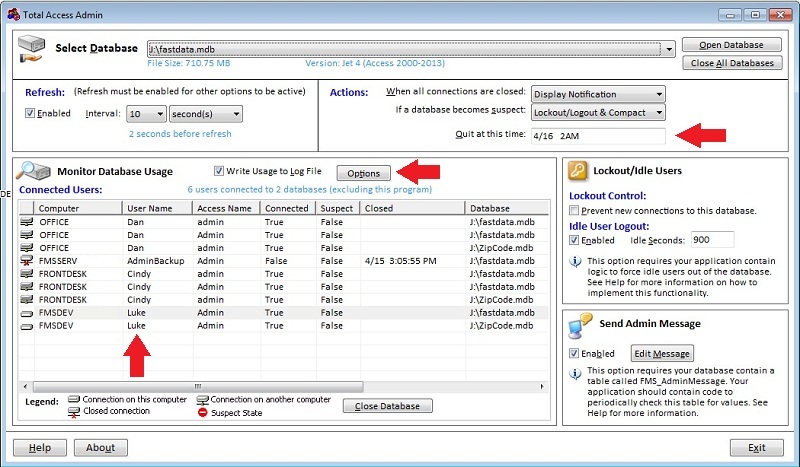 Total Access Admin lets you monitor users going in and out of your databases in real-time. See who’s currently in your database and who recently exited, create a log of connections and disconnects, compact the database after everyone exits, etc. Monitor all the databases across your network from one installation of Total Access Admin. Total Access Admin 2013 supports ACCDB databases created in Microsoft Access 2013, 2010 and 2007, plus MDB databases created in any version of Access. Existing customers can upgrade at a discounted price. This error occurs if another user (or instance of Access) has opened up the database exclusively and you try to open it. Maybe the other user opened the database in exclusive mode or made some modifications such as editing modules, which put the database in exclusive mode. However, that may not be the case. This error can occur even if the other user has the database opened without opening it exclusively. What’s going on? Why would the second instance think it’s being opened exclusively? What if the Other User isn’t Opening it Exclusively? It turns out that another cause of this error is not immediately obvious and is related to workgroup security files. This applies to MDB files (not ADP or ACCDB formats). If two instances of Microsoft Access (DAO database engine) are using different system MDW files, a conflict may occur where the database appears to be exclusively locked by the other instance. The MDW file used by your instance of Access can be checked in VBA by examining the value of DBEngine.SystemDB. Another copy of Access or DAO may have that database opened using another MDW file causing this conflict. This can come from another instance of MS Access, a Microsoft Access add-in or library reference, a VBA Add-in, or other program such as VB6, .NET, etc. that’s connecting to that database. To avoid this, if you’re using workgroup security, make sure every instance is pointing to the same shared MDW file. This is often defined in the shortcut used to launch Microsoft Access, or if you are opening a different database programmatically within your VBA code. Visit our Microsoft Access Error Number and Error Description Reference site for a complete list of Microsoft Access error numbers, many with links to resources explaining and resolving them. If you’re interested in seeing who’s going in and out of your database in real-time, check out our Total Access Admin program. It’ll let you monitor multiple databases across your network to see when users enter and exit your database and flag instances where connections are dropped suspiciously.